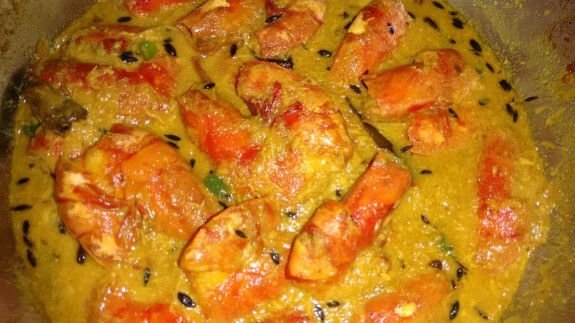 Chingri Malaikari is always a classical food among Bengalis. It is a traditional dish which is served in party occasions as well as part during lunch or dinner in Bengali household. 1. Clear all the prawn properly and light boil it for 5 mins in water. Add turmeric and salt on the water while boiling. 1. Heat oil in a pan and add cumin seeds, bay leaf, red chilly. Add cumin paste and little salt, turmeric powdered, red chilly powder, chopped green chillies and 1tsp sugar. (Please keep in mind while adding salt as you already added salt previously while boiling the prawn). Saute it for 2-3 mins. 2. Add boiled prawn and cook for 2-3 mins on medium heat. 3. Add coconut paste and mix it well. Cook for 2-3 mins. 4. Add the boiled water and if required add more warm water. Cook it for 5 mins on low heat. 5. Add 2 tsp roasted garam masala powder and mix it well. Serve hot with Gorom Bhaat(Steamed Rice) for the best taste.